Why macro-patterning your nutrition is the key to getting your best body (a new way of burning fat that’s actually fun?). learn how simple it really is to manipulate carbs and force your body to burn fat. Stage 1: Immediate Energy Needs: Digestion begins in the mouth and carbohydrates are quickly made available for energy needs or stored for later use. Stage 2: Storage in the Muscle & Liver: Your body stores carbohydrates as glycogen in the muscle and the liver as a source of energy for movement and daily function. The amount of these stores equates to the amount of muscle on one’s body. Storage continues until the muscle and/or liver is full. 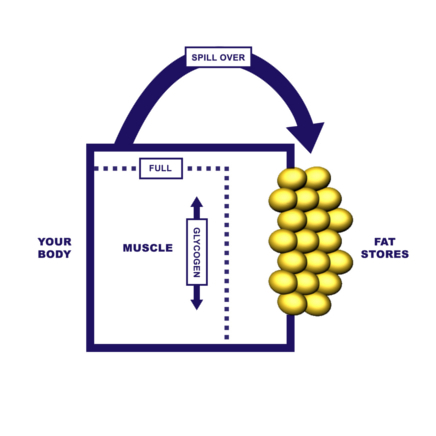 Stage 3: Spillover (Storing Fat): When energy intake is abundant and little or no energy is expended, muscle and liver stores over fill, and the body starts storing the unused energy as fat. Want to discover how you can keep all of your fat burning hormones at peak levels and prevent your metabolic triggers from adapting and blocking your fat loss? The Free Video above reveals precisely why macro-patterning your carbs can keep you lean for life. Carb manipulation and macro-patterning is also the hidden secret to re-programming your body to stop losing things like water and muscle and actually forces your metabolism to continuously find and burn stubborn body fat. Plus, it actually can make fat loss fun to learn and apply too. Now you can keep your body burning and your metabolism happy at the same exact time! My wife Karen and I laughed our a** off when we saw this cartoon. Listen, it doesn’t have to be this way! Forget about the scale. If you start using and applying a macro-patterning lifestyle you can just say “no” to scales and diets and say “yes” to being a life-long fat burner. I loved this. It is exactly what I was doing. I kept skipping over the macro-patterning cycle. I just got back on and it made a big difference.